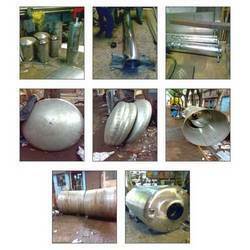 We are one of the leading organizations, rendering unmatched Fabrication Work to the clients. The fabrication works we undertake are rendered in a proper planned manner, under the guidance of skilled workmen, who make use of latest machines and advanced methodologies. Depending upon the clients' specific requirements, we render offer these works for fabrication of Water Treatment Plant, Water Treatment Spares Part and Reverse Osmosis. Clients associated with us demand these services in water based industries. Over the period of time, we have attained proficiency in facilitating clients with unmatched Water Fabrication Work. All the fabrication works offered by us are rendered as per the exact specifications detailed down by the clients, thus meeting their application specific requirements. While executing the fabrication project, our team members adhere to international industry standards and ensure that an unparalleled set of services is offered to them. Furthermore, we ensure that these services are acclaimed for their reliable, flexible, on-time and customer-oriented execution. Looking for Water Fabrication Work ?